I've had a couple chances in my lifetime to meet my cycling heros. Every morning before 4th grade I would watch a scratchy tape of Greg Lemond beating Laurent Fignon in the final time trial of the Tour de France. Later that year he came to Washington for a charity ride. I couldn't approach him. My dad finally said, "well if your not going to go over there then take a picture of me!" My next cycling hero was Tim Johnson. This past Fall I was back to back with Tim. I froze and took the infamous photo of Timmy's shoes. On Thursday night Katie Compton was in Missoula. Not only was she in Missoula but she happened to be at our favorite brewery the Kettle House. It was Lindsy's birthday and she was still wearing her spandies. Without hesitation Campbell walked right up to KFC and started a conversation. Katie is cool. A true champion. I ran over and snapped a photo. Meeting your hero on your birthday and having her exceed your expectations doesn't happen every day. Campbell is in to cycling, we all know that. However, meeting KFC and having her encouragement is a whole new level. So, here's my message: All you Montana Legends (you know who you are) never under-estimate the influence you have over all of us aspiring bike racers. I remember last year after the Belt Omnium Scotty Herzig took Willy on a cool down ride. I don't know what was said, but knowing Scott I'm sure it was extremely helpful. I bet Willy could replay every word. 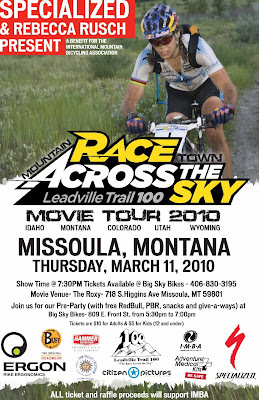 I remember one of my first group rides in Missoula. I was all over the place, riding horribly. People were not happy. On the freeway out to 9-mile a guy on the back of the pack introduced himself and said I was riding good. Later this same guy was the only one to stick with Teejay on Steakhouse climb. One of the worst rides I'd ever been on was now somehow ok.